moisturizes, restores & maintains protective skin barrier. patented Multivesicular Emulsion (MVE) formulation. CeraVe™ Moisturizing Cream is a vital part of a daily skin care routine. Its patented MVE formulation releases ceramides and other essential ingredients throughout the day, so they penetrate deep into the skin to hydrate and nourish. Try CeraVe™ Hydrating Cleanser and CeraVe™ Moisturizing Lotion for a complete skin care routine. CeraVe™ Moisturizing Cream provides all-day moisturization with a single application and is clinically proven to increase skin hydration. It contains ceramides, naturally occurring components of the skin that play a key role in enhancing and restoring the skin's protective function. Also included are vital humectants and emollients to replenish and retain needed moisture. The unique ingredients in CeraVe™ Moisturizing Cream help restore damaged skin and keep skin healthy. 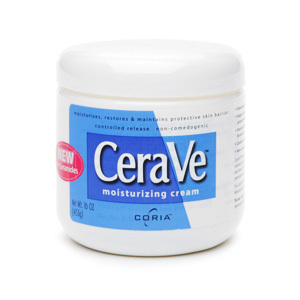 CeraVe™ Moisturizing Cream is ideal for elbows, knees and heels, or anywhere that requires extra moisturization. With its patented Multivesicular Emulsion (MVE) formulation, CeraVe™ Moisturizing Cream helps restore and maintain the skin's natural protective function. MVE works by trapping ingredients within multi-layered vesicles that are slowly released, layer by layer throughout the day, penetrating deep into the skin to moisturize and nourish. CeraVe™ Moisturizing Cream spreads easily and absorbs quickly. It is non-greasy, non-comedogenic and non-irritating.